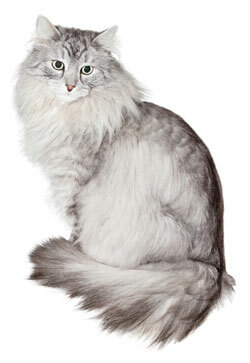 The Siberian is a domestic cat breed that has been present in Russia for centuries. The full name of the cat is the 'Siberian Forest Cat' although sometimes referred to as the 'Siberian' or the 'Siberian Cat'. The cat is an ancient breed that is now believed to be ancestral to all modern long-haired cats. The cat has similarities with the Norwegian Forest Cat, to which it is likely closely related. It is a natural breed and the national cat of Siberia. The Siberian is very dog-like. They are loyal cats that will come to greet you. This cat breed appears to be fascinated with water and they are likely to drop toys in it. They are a friendly breed, good with dogs, energetic, and smart.